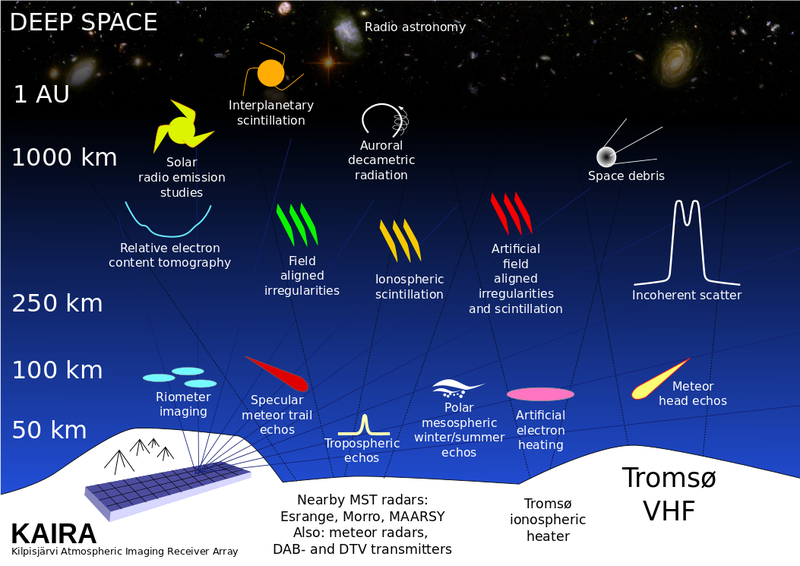 As we’ve seen over the past few instalments of this series, as the direction in which the radio waves approach the telescope changes, the received signals will go out of phase. 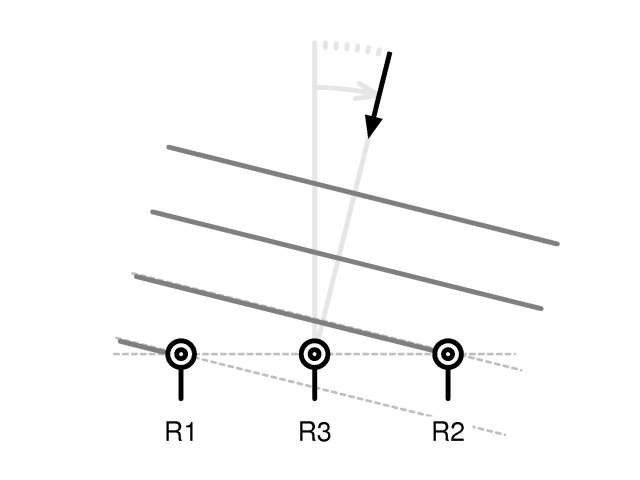 This effect reduces the sensitivity of the telescope in that particular direction. Additionally, by adding a delay to the electrical signals (whether the analogue electrical signals or the digitised version) the direction in which the telescope is sensitive can be moved. As the incoming direction changes, the signals go out of phase, and thus cancel. However, if the direction continues to change, the signals can actually start to come back in phase again. 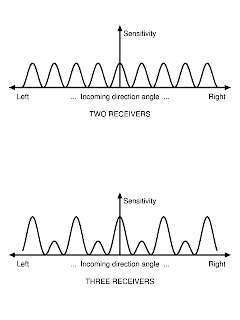 The peak of one wavefront signal comes through one receiver and adds together with the peak of a different wavefront signal that has come through the other receiver. Click on the following image to get a full-sized version and you'll see what we mean. At first appearance this might seem like a good thing, as the telescope seems to be sensitive to several directions at once. But it is not. Instead, this leads to an ambiguity. If a signal is received, it is impossible to tell whether that source of that signal is at the ‘on axis’ direction of the telescope, or is in a region off to one side. These directions of sensitivity that are not in the intended pointing direction of the array are referred to as ‘sidelobes’. However, there is a way to alleviate this. 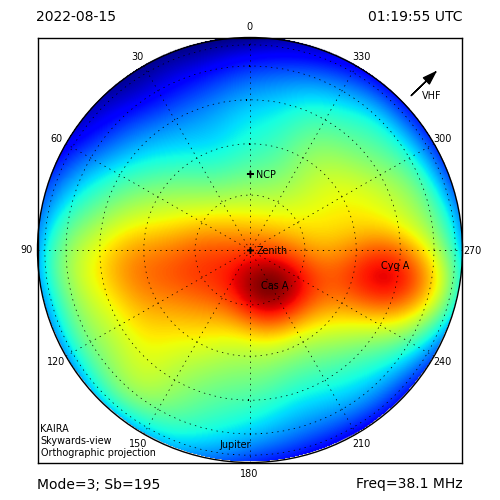 This is done by adding more receivers to the array. In our example, let’s consider adding a 3rd receiver between the original two. 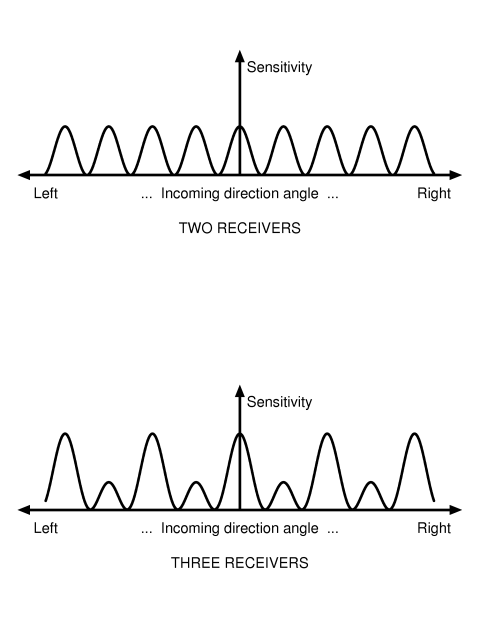 Now, even though there may be ambiguity on the signals received by the first two receivers, the middle receiver is out of phase with the others. Adding more and more receivers improves this even further. As more receivers are added, it will have the effect of suppressing more of the sidelobes and thus reduce the ambiguity of the telescope.